Just noticed a pretty glaring continuity error, probably the only big one in the series. died while posing for his portrait. Recently, I was browsing the Wikipedia entry for the show King of the Hill when I came across the term "retcon", which I had never heard before, but which refers to a phenomenon with which I am familiar. "Retcon", a verb, is a portmanteau of the term "retroactive continuity", which refers to "the alteration of previously established facts in a fictional work." St. Elsewhere pulled a pretty big retcon, and I'm glad they did. In the third season episode, "Give the Boy a Hand", we are introduced to one of my favorite recurring characters, local artist Alex Corey (Jeff Allin). Alex has been hired to paint a portrait of St. Eligius's Chief of Services, Dr. Daniel Auschlander (Norman Lloyd), to celebrate his long tenure as the hospital's head administrator. The portrait is to hang in the chapel alongside that of Father Joseph McCabe, who founded the hospital in 1934, according to this scene. I watched St. 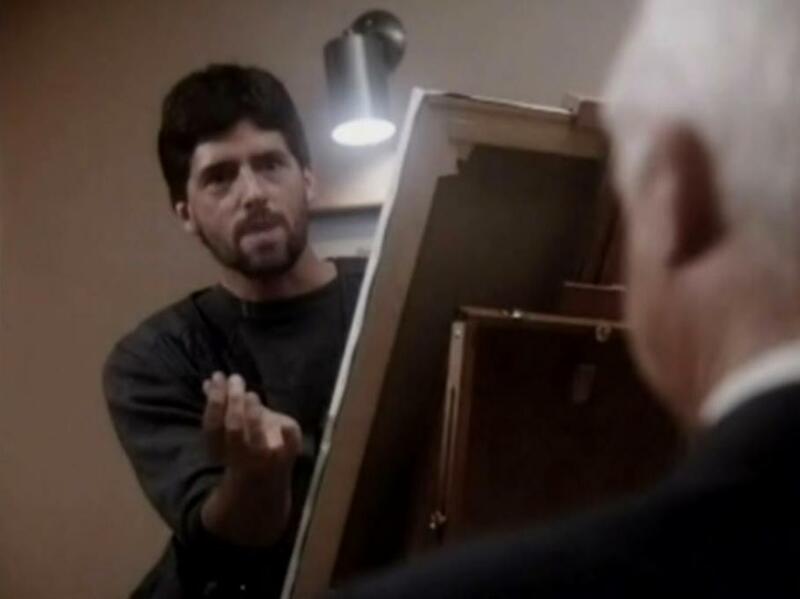 Elsewhere's seasons in reverse order on the Prime cable channel back in the nineties, and until I saw this episode, I had wondered just how the hell this guy ended up painting Dr. Auschlander's portrait, judging by his three subsequent appearances. Alex Corey is a very serious artist. He resents the assignment, and he's not shy about sharing his feelings. His father painted the portrait of Father McCabe, so he was given the job. In between gripes, he tells Dr. Auschlander that his father was amazed at how perfectly still Father McCabe could sit. That is, until the elder Corey discovered that his subject had died. This version of events stands until the following season, when the history of St. Eligius was explored in the four-Emmy-winning two-part episode, "Time Heals". It starts off with a flashback to the hospital's grand opening in 1935. We learn that Father McCabe, rather than dying in his chair as an old man posing for his portrait, departed the hospital in 1955, dismissed after the hospital was sold to the City by the Catholic diocese, and was re-assigned to Arizona. Edward Herrmann earned an Emmy nomination for his guest appearance as Father McCabe. not exactly kicking, one year later. 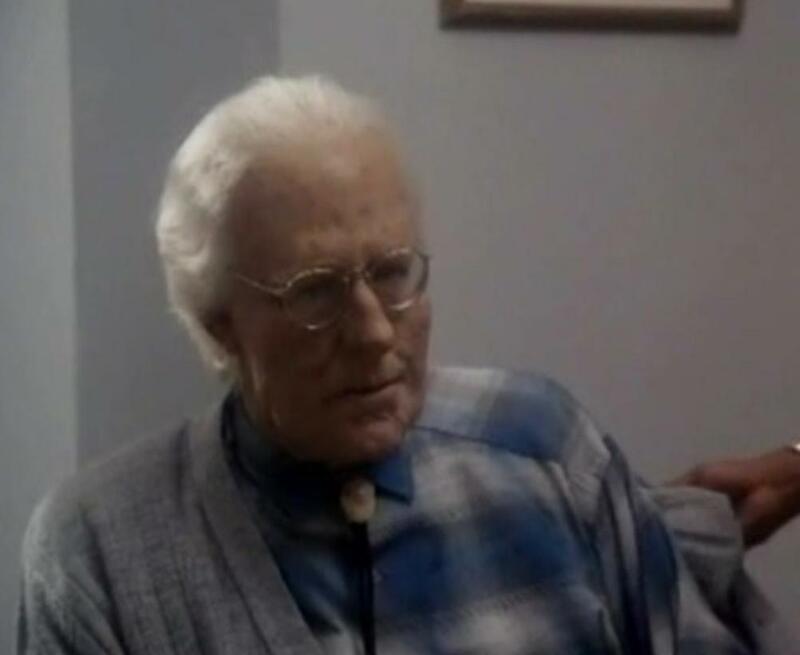 Father McCabe returns in the season five premiere, "Where There's Hope, There's Crosby", so there's no doubt that his presumed demise in season three has been re-written. He comes to St. Eligius from Arizona suffering from ALS and about to take up residence in a nursing home. He is paralyzed, depressed, and he wants to be euthanized until he is inspired to carry on by a heartwarming encounter with Dr. Westphall's autistic son, Tommy. These days, I'm accustomed to having back episodes of my favorite TV series at my fingertips, so I have to think back to my younger days to remember how they used to broadcast network TV shows. A few new episodes, then a rerun or two, either from a previous season or the current one. They'd spread out the twenty-two episodes from September to May. You'd see the old episodes again, but few people had VCRs back then, so it wasn't like you were expected to go back and look up what happened. So I'm thinking stuff like this wasn't as big a deal back then, unless you were an obsessive detail hound like me. I feel the poetic license was justified in this case. Edward Herrmann as Father McCabe is a great addition to the show's mythology. After "Time Heals", they changed the portrait of Father McCabe in the chapel to resemble Herrmann. It's clear that the "Time Heals" version is the preferred version of events. Update, February 1, 2014: Spotted another one... In season two's "Vanity", the voice-over in the TV documentary on Dr. Craig mentions that St. Eligius became a public hospital in the late forties. That got re-written in "Time Heals" as well. of Father McCabe in "Breathless". Update, February 21, 2014: The Father McCabe story actually changed twice, I've discovered. 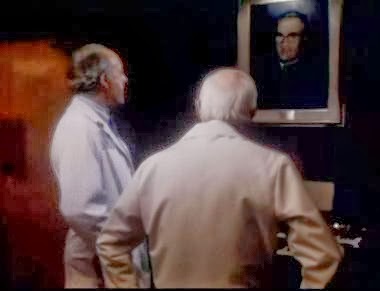 Early in season three, in the fifth episode, "Breathless", Daniel is in the chapel communing with the portrait of Father McCabe (he feels remorse over his handling of the nurses' strike and discovering that longtime maintenance supervisor Raleigh Morlin is suffering from asbestosis from working at St. Eligius) when Dr. Donald Westphall (Ed Flanders) enters. Daniel asks Donald if he ever met the man, and Donald says 'no'. (In "Time Heals"--Father McCabe is a mentor to the troubled young Westphall.) Then he states that McCabe founded the hospital in 1932. Ah, things were so much simpler before we had all this digitization!